Docs now have the "clipboard" - not the orange missing texture. Fixed some clipping in the war room "office" where you could see hinding player models thru the wall. Missing light texture in cieling downstairs is fixed. Silent door near axis spawn is fixed. 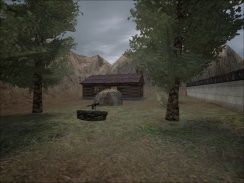 Added a small shed near Allied spawn as a place to take cover in. Added a small house ruin near the main entrance of fortress. Added another underground passage that ends up in the small house in the V2 Base yard. Added some crates and barrels to the V2 Base yard to take cover behind. Fixed the spawnpoints so that they show up on the command map and are selectable. Added some trees and dragonteeth outside the fortress. You can still jump the base wall, but that barbwire has got a nasty touch now. Reduced game time to 20 minutes. Axis got 5 seconds longer spawn time. Removed the tower spawn MG42. Added some trees near Allied spawn. Added wooden fence near Allied spawn and moved the door. 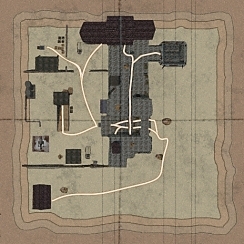 Added truck near Allied spawn. Added some clips where needed. me not having the level design skills required at that time. Allies to get into the fortress and I also added another way out from the underground bunkers. 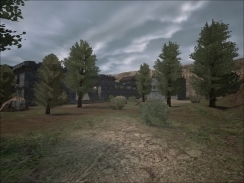 I have also added a number of constructibles such as command posts and field MG42's, it is also possible to plant mines on the terrain. 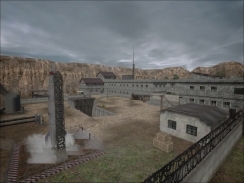 *Steal the V2 Rocket blueprints from the Axis base. *Transmit the blueprints using the base radio. *Destroy the Base Wall to get free passage into the V2 Base. *Capture the Fortress Tower Spawn. *Destroy the basement storage wall for additional access route. *Prevent the Allied forces from stealing the V2 Rocket blueprints (When stolen sirens turns on globally). *Prevent the Allied forces from transmitting the documents using the base radio. *Prevent the Allied forces from destroying the Base Wall. Put the v2base.pk3 file in your etmain directory. The mapname is v2base_te if you want to add it to any script. Special thanks to Ringa who helped me with details, icons, command map and good ideas. Thanks to everybody who has been helping with the testing and all the regular players at the SteelRat's Cage ET server. Thanks to Drakir for providing Health and Ammo Cabinet prefabs. Thanks to all the helpful people at Splash Damage's Level Design Forum! Thanks to Unter Elite for selecting V2 Base TE as a tournament map!